This is the first in a new monthly series at Gecko Time. Thinking well beyond the basic care issues for popular gecko species, Gecko Time is interested in hearing from established breeders about more advanced topics such as market trends, issues unique to the particular species and long term breeding considerations. Each month, Gecko Time will put three questions to established breeders of a gecko species to get their thoughts on these issues. 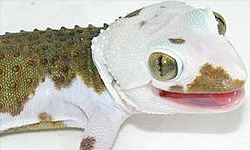 The first article is about leopard geckos, with articles about crested geckos, fat tail geckos, gargoyle geckos planned. If you have a request for a species to be spotlighted or a suggestion for questions you’d like the answers to, please comment below. What is the average number of successful breeding seasons you have with your females? Do you feel this has changed at all in the past 10 years? If so, why? Ray Roehner: Female leopard geckos’ peak breeding years are from ages 2-6. Younger females can be bred, but many females are not fully developed at 1 year of age and could have great difficulty passing the very large eggs that leos can produce. Taking chances with valuable females who could become egg-bound just isn’t sound breeding policy. 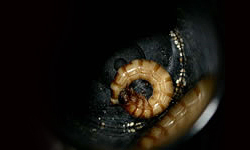 As for how many seasons to breed a female, we generally only breed females for two seasons, depending on the morph and the number of eggs the female produces in a season. Some of the albinos and giants may only produce a few eggs in a season, while some designer morphs can produce 14 or more in one season. Overbreeding females is not sound policy and borders on inhumane care. I encourage novice breeders to become educated on proper breeding, and always take into account the humane aspects of animal care and husbandry. Kristi Housman: I really don’t breed my females for a very long time. I prefer to either bring in new animals or hold back animals as opposed to using a female for too long. I’ve probably bred one female for 3-4 seasons so far and may continue to breed her for another 2-3 seasons before retiring. I’m not a fan of trying to breed a 10+ year old female. I just feel like she should relax and not have the strain on her when she’s older. I do notice that year one usually gives me less fertile eggs, but not always. I had one first year breeder give me 18-22 eggs. It was quite a few years back, so I don’t remember the exact number. I think I’ve always felt this way, so nothing has really changed with me over the years. Lisa Brooks: I started breeding leos in 2012 and this will be my fourth season coming up. I still have females that will be breeding from my first season and they still seem to produce adequately well for me (10 eggs or so from them each last season). I haven’t really been breeding long enough to give you an average or tell you if it has changed for me yet. What is your opinion about the explosion in the number of named morphs that has occurred in the past few years? What is your opinion about the actual number of new visual traits that have developed during the past few years? Ray Roehner: The leopard gecko hobby has indeed exploded in popularity in the last 10 years, with many skillful genetics experts producing amazing new morphs and crosses. I do feel that many so-called new morphs are really crosses of existing morphs, and not truly new morphs in the scientific sense of the word. Some breeders are producing beautiful new lines and call them new morphs, when in reality they are merely their own lines of existing morphs. At Designer Geckos, we worked on producing our own lines called Zorro Bandits and Mandarin Tangerines, which have become very successful lines sought after around the world, but they are not new morphs. They are just our own lines, produced by careful selective breeding from other existing lines’ best examples. So while there is no regulatory body determining genetic aspects like “new morphs”, breeders need to be careful to be both scientific and ethical when making pronouncements of new morphs. Kristi Housman: I am not a fan of names as most people already know. I’m pretty outspoken about it. Names are ok when they are really a new morph or new combo morph, but even then, it’s important to use the actual genetics and list them. It’s how people learn. Most new names out there haven’t been for new morphs. I’m seeing more and more people naming things that have already existed. Or they are creating new “lines” without doing the actual work or understanding what a line actually is. The naming is getting out of control and shouldn’t be encouraged. There have been weeks where I have seen 2-3 new names on facebook and none have been anything truly new. I look at it as a way for someone to try to look more important or to try to get more money for something. It’s shady and I won’t buy from those people. There are some true new lines and morphs out there, but not many. When a new morph is discovered, I think it needs to be fully tested before it is released to the public. A new line should be something that has been worked on for years and is reproduced consistently. Too many people combine two existing lines and call it something new and that’s not right. Do the work and try to make something truly unique. It will be worth it. Lisa Brooks: I don’t necessarily have any issues with names. I think that labels generate interest and advertise cool colors and breeders’ work on projects and ideas. I do acknowledge, however, that they can be confusing or in some cases deceiving for newcomers that have not done a lot of research. Before buying animals as a breeder it’s important to learn what terms are buzz words and which are genetic and what the basis of those terms are. Contact breeders and speak with them by phone or email and ask questions. You should be able to ask the breeder what the basis of their morph name is and understand the reasoning behind it. It’s important to take some time to think about the answers you get and compare levels of knowledge and the clarity and consistency of responses you get from different breeders and use that insight to decide what and where to buy. While there have not been a huge number of new visual morphs on the market in the past few years, those that are new and have been proven to be consistently reproducible should come down in price and add some spice to the hobby soon! There definitely are fewer races for “firsts” with producing morphs. The lack of these races has definitely encouraged many breeders to focus on increasing the quality of the colors and traits of the genes they work with. I believe this has had a positive impact on the direction of the hobby in many ways. What do you feel is the best course of action for breeders to take to insure the viability of the leopard gecko market for the next 10 years? Ray Roehner: There has been an influx of many new leopard gecko breeders in recent years, which in some cases has led to overbreeding of geckos and market saturation. The marketplace can only handle so many geckos worldwide, and overproduction can have very detrimental effects on sales and prices. The economy has been depressed for the last several years, and the reptile business has been greatly affected. I have seen many anxious young breeders dive head first into breeding geckos, only to find out they can’t sell their animals. Then what do they do? Taking care of large numbers of animals you can’t sell is a very difficult quandary! I think people need to tread very carefully now until the economy picks up and the market can handle more gecko production. The good news is, now that US elections are over, the economy may very well improve, which will help all businesses, including the reptile industry. The key is to only produce the numbers of animals that the market will bear. 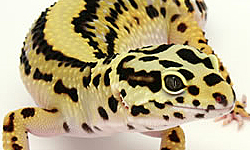 The leopard gecko business is a difficult business to break into because there are many well established breeders in the world already, so I suggest new breeders do a careful market analysis to determine the best course of action for their business plan and gecko production for the market. Kristi Housman: This is a tough one because social media has made it very easy for anyone to call themselves a breeder. It makes the market crash a bit when there are so many “cheap” animals out there. I would encourage people to breed ethically, do the work, and try to improve on the morphs. Creating nicer looking animals with known genetics will help the market. Explain ethical breeding to new people starting out. Encourage new breeders, but encourage them to breed responsibly. Also, try to keep it interesting and get new people involved in the hobby. I find that trying to educate new people is helpful. Even if only a few people listen, that’s a few new people who will become great breeders in the future. Make it fun, but always educate. I think the market will go through phases of up and down and I’m not sure if there is anything we can do to change that. New morphs do help the market and get people excited again, but they really do need to be truly new and not something made up. Lisa Brooks: I’m not sure there is a one size fits all answer to this. My approach is to produce a small number of high quality babies and to try to refine the direction and results of my projects each year. My babies aren’t necessarily something never seen before but they are clean, healthy, high quality examples of the morphs they represent and I am proud of them. The market will always be flooded with pet-quality animals but pushing the envelope to make “old” morphs vibrant and interesting is what interests me while working in a bit of novelty at the edges. This focus on quality and consistency is what works for me. To summarize, there seems to be a consensus among the responders regarding the questions asked: don’t breed females for too long, be clear about the genetics without getting seduced by fancy names, produce high quality geckos in limited numbers and educate potential breeders and buyers. One of the less considered aspects of breeding female leopard geckos for a limited amount of time is that eventually there will be an increasing number of retired breeders that need to be cared for or sold. Gecko Time has had some success selling retired female breeders to those who want a mature pet, but the market for these females appears to have decreased significantly lately. Gecko Time wold love to have an article about what makes a new morph and what makes a new line. Anyone interested? Ray Roehner began collecting and studying reptiles and amphibians at the age of five. When he was 14, he worked in the animal labs of a major cancer research hospital where his interest in animals, and in particular high quality animal care and husbandry, nurtured his desire to work in the animal field. His subsequent science degree, coupled with his certification as an animal technologist, put him on the career path to manage the animal research efforts of two major companies in cancer and diabetes research. His love for reptiles continued and he became fascinated with leopard geckos, studying them and developing a high quality care program based on the many studies he designed and conducted to develop cutting edge care protocols to produce and maintain leopard geckos of the highest quality. Kristi Housman owns Ghoulish Geckos. She is starting her tenth season of breeding leopard geckos. She keeps other species as well, but doesn’t breed them. Lisa Brooks is the owner and keeper at Carpe Gecko. She acquired her first leopard gecko (a SHTCTB!) in 2005 and has kept and bred leopard geckos ever since. 2017 will be her 4th season breeding as Carpe Gecko. Her breeding plans focus on bright bolds, flashy raining red stripes and brilliant sunglows as well as several other species of geckos. In addition to breeding and keeping geckos she is a certified biology teacher in NJ, holds degrees in animal science, entomology, and has a doctorate in science education. Neat article! I love hearing from established breeders.